This extraordinary exhibition of more than 100 mixed media works by Aminah Brenda Lynn Robinson explores the artist’s memory of her Columbus, Ohio, neighborhood, while celebrating her African American heritage and reconstructing the complex histories of vanished communities. Symphonic Poem is a project representing more than 50 years of research, travel, and artistic virtuosity and inventiveness in multiple media. The exhibition presents a diverse body of work that ranges from drawings and woodcuts to complex sculptures made from natural and synthetic materials, such as twigs, carved leather, music boxes, and “hogmawg,” her own material composed of mud, grease, dyes, and glue. Pictured above, To Be a Drum, is a rag drawing that incorporates painting, hogmawg, and found objects, which Robinson conceptualized as an illustration for a children’s book by Evelyn Coleman. 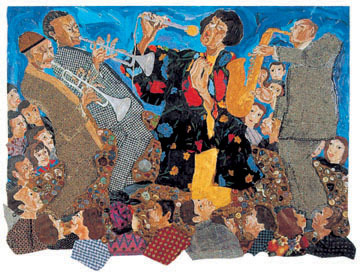 She was deeply affected by the story, describing it as “a reflection of bridges to cross—Africa, the Middle Passage, slavery, civil rights, the artists, the teachers, the heroes, and always the children looking to the future.” In her ongoing series Pages in History, Robinson also depicts influential people and events, both celebrated and obscure, from African American history. One of Robinson’s primary concerns is with the preservation of shared history and its bearing on individual experience. Her intricate mixed media cloth paintings called “RagGonNons” are memorials to each of her parents that also recount ancestral struggles and the relationships that created their communities. “RagGonNons” continue to evolve in response to viewers’ experiences of them. They participate in the West African concept of Sankofa—one must learn from the past to be able to move forward. Born in 1940, Robinson was raised in Columbus, Ohio, within the close-knit community of Poindexter Village, one of the country’s first federally funded metropolitan housing developments. Her artistic ability emerged at a very young age with her family’s encouragement; from her father she learned the processes of book-making, from her mother, button and needlework. Robinson received her formal art training at the Columbus Art School (now the Columbus College of Art and Design). She continues to live and work in Columbus. Her memories of Poindexter Village are an enduring source of inspiration, as are her research expeditions to Africa, the Middle East, and South America to study regional traditions and art forms. Through her vibrant, expressive compositions, Robinson chronicles the culture of both enduring communities and those no longer in existence. Robinson was a recent recipient of a prestigious MacArthur Foundation Fellows grant. Her work has been presented at a number of museums and galleries, including the Akron Art Museum, Ohio; the Oakland Museum; the Baltimore Museum of Art; and the Studio Museum in Harlem. Symphonic Poem: The Art of Aminah Brenda Lynn Robinson was organized by the Columbus Museum of Art in partnership with Arts Midwest and the Ohio Arts Council. The Brooklyn Museum exhibition is being coordinated by Charlotta Kotik, Curator and Chair, Department of Contemporary Art. The Brooklyn presentation is made possible by the Brooklyn Museum’s Barbara and Richard Debs Exhibition Fund. New York Amsterdam News is media sponsor.